As a long-time student of dance, my aim has always been not to "just do it", but to do it well. Time to share some tips and tricks I've learned over the years! And not one of these involves tracking down hard-to-find performance tapes, or paying out big bucks for instructional videos. Instead, they're very accessible - all things you can do for yourself, without spending a cent! One of the most appealing aspects of Middle Eastern dance is the broad scope it offers for individual expression. So rather than just aping your instructor, let movement come from deep within, allowing it to emanate outwards. Try doing a move with your eyes closed. Does it feel different from the way it looks? Can you do it smoothly, or does it "catch" somewhere? Can you do it evenly on both sides? One of my instructors calls this tactile sensation "muscle memory". Another way to approach this kind of understanding is to try to explain a movement as if you were telling someone who has never belly danced. In fact, correction is nothing more than another option being presented. Try what is suggested, in the spirit of a new experience. If you like it, then claim it as your own. If not, just let it go - it's not worth keeping. When choreographing for himself, Michael Jackson never used a mirror. Why? Because, he said, mirrors make you pose. In other words, they can make you too self-conscious. Some disciplines use a mirror as a means of checking body alignment, but mirrors can have limited benefits as correctional devices, because their use makes it difficult to see yourself objectively. In my opinion, the best way to use a mirror is to let it reflect your own joy in movement back to you (indeed the word "dance" has its roots in the Sanskrit "tanha", meaning "joy of life".) It's easy to become dependent on the mirror, and some dancers find they even become disoriented when they dance without one. Yet the mirror is usually very much "there" in class, so how is this to be avoided? Here's what I do. I pretend that someone I admire, or am even attracted to, is watching the class. And I dance solely for them... and I dance to impress them. Smooth transitions make for a seamless performance, yet in many of the belly dance classes I've attended, they've rarely been discussed. Let's start with a definition: essentially a transition means moving a part of the body that is extended in some way back to a neutral or central position. Here's a simple example. If we execute a hip circle by first moving the hips to the side, then to the front, to the other side, and finally to the back, then all we need to do to return the hips to "center" is to relax the pelvis. We are now free to move the hips any way we like. Another example, this time involving the arms and head. Let's say that you have one arm extended high overhead, and the other is to the side. If you move both arms so that they are extended in front of your chest, it's quite easy to reverse their initial position. If you would prefer the movement to look more like dance and less like semaphore, start by adding your head: look toward the arm extended to the side, and when you bring your arms to the center, move your head to the center as well. Make the movement lovely by rounding your arms and leading with your wrists; if you like you can cross your hands when you reach center. Now a third example, using feet. A lazy hip walk to the side is basically a step, touch, step, touch, leaving the hip behind as you step out to the opposite side. In other words, if you're stepping to the left, the "lazy" hip is the right one. When you bring your right foot close to the left for the "touch", that is your transition point: you can continue to the left, or change direction to start stepping to the right. Add the arm movement described above, and look at you - you're dancing! As a bonus, I find that working on transitions is invaluable for helping me remember choreography - something I'm not very good at! Ask Yourself: "Where's The Money?" We have Len Gibson, a jazz and tap teacher from New York City to thank for this wonderful phrase. He used it to remind us that the audience is our bread and butter - for belly dancers, if you prefer, our pita and hummus! - and that we must never lose sight of that, even in class. He'd use the expression in class whenever one of his students became too introspective, gazing at their feet or studying their nails. Dancing in a club or restaurant offers many opportunities to acknowledge your audience. It's fun to let someone think you're dancing for them alone, if only for a brief moment. When executing a horizontal hand undulation, for instance, focusing on your hand will make you look cross-eyed. But if you project your gaze beyond your hand while still following its path and "seeing every little thing in the room" (as one of my instructors advised), you'll be able to involve several audience members in just a few short seconds. It's this kind of trick that can help keep each performance fresh! If you're uncomfortable making direct eye contact, you can opt for focusing on noses or foreheads instead, or it can help to think of their faces as pink balloons! The more you do it, the easier it gets. And did you know that a little nervousness may actually enhance your performance? It gives you a special glow, plus a burst of energy to make your entrance lively and unforgettable. What about this interesting idea from dancer / teacher / choreographer Roula Said: go shopping in the audience (!) 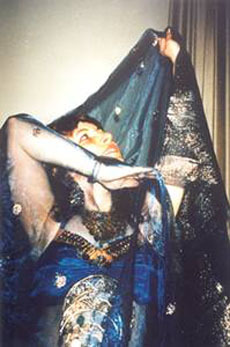 In one memorable class, she had us pretend that we were in a souq - a Middle Eastern market - as we danced around the studio. "Ooh, look at those earrings! ", "I've just got to have that caftan!" Then Roula began clowning, as only she can, parodying herself performing: "Hmmmm, you're not bad looking!" ... "No thanks, you've been eating garlic!" It was one of those marvelous classes that stays with you forever. These are just a few of the tips and tricks that work for me. I share them in the hope that they may help you discover some of your own (which I hope you will in turn share with us!) Because those will be the most effective ones, allowing you to make the dance uniquely your own. Arabella would like to dedicate this article to Dr. M. S., without whose adroit skill it never would have germinated, let alone come to be written.